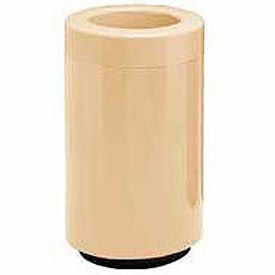 Fiberglass waste receptacle provides an attractive addition for trash disposal to any indoor and outdoor environment. Ideal for airports, malls and cafes. This trash container doesnt rust, dent, stain or tarnish. Fiberglass garbage can is Fire Retardant - Rated Class 1 for ASTM standards. Withstands extreme temperatures for outdoor use and have no exposed seams, welds, or crevices that will collect dirt. Lid is removable for easy access. Trash can includes removable rigid liner. Non-Returnable; Non-Cancelable.